Desmond Wallace is a fun-loving 9 year old Scorpio from Kihei who loves riding his skateboard and has won multiple skate contests on Maui. You can find him most nights at Kalama Skatepark skating the mini ramp and in the water every weekend on his SUP looking for turtles or catching waves on his boogie board. Des also trains Muay Thai and Jiu Jitsu. He’s proud to be a Team Rider for Raw Love Sunscreen and Aloha Skateboards. He’s also proud of landing a Fakie Shuvit on the mini ramp. 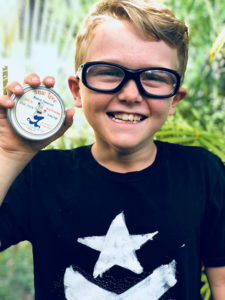 Desmond understands how lucky he is to grow up on Maui and how important it is to keep the ocean and its inhabitants safe from dangerous chemicals. 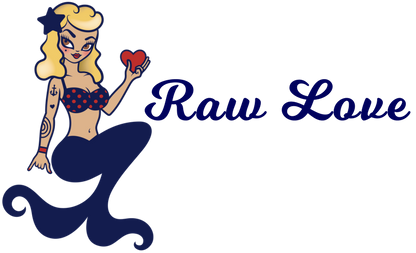 Raw Love Sunscreen keeps him safe from the sun and keeps our oceans healthy. Taj Makai Newton lives in Hana and is one of Maui’s upcoming talented surfers. He loves that Raw Love Sunscreen does not harm the ocean, since that is so much part of his life and soul. Taj has a passion to succeed in his surfing career and all his hard work is paying off—he qualified for state and global competitions and has placed 16th in the world. His future is bright and he is super excited to rep Raw Love. 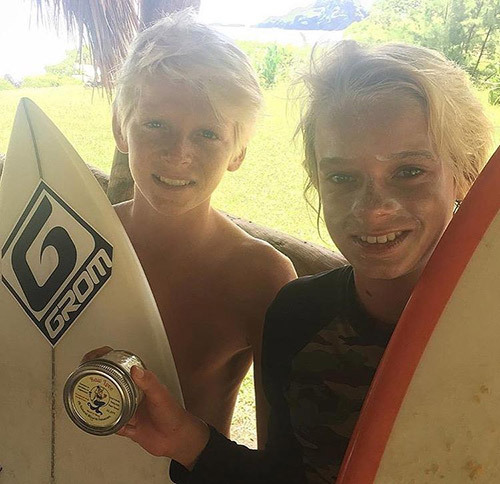 Kannon White is a 13 year old surfer from Maui who absolutely loves surfing and he looks forward to it everyday. Words can’t even describe what surfing has done for him, he says. He surfs 5 out of 7 days of the week. When he is not surfing or skating, he is doing his homework to maintain being a good student. Kannon thinks it is good to use sunscreens such as Raw Love that do not contain Oxybenzone, a chemical that can harm our reefs. This is why he is proud to represent “the best sunscreen he has ever used.” He can always count on Raw Love to keep him safe from sunburns. Makana Findley is a 14 year old Pisces who lives in Hana. He loves to take pictures of all the local groms and the beautiful island, as well as bodyboard and dive. He knows how important it is to keep our ocean healthy. He loves Raw Love Sunscreen because it helps to keep our reef thriving, ocean healthy, and best of all—he’s not sunburnt.